Organic conditioning treatment that Strengthens hair instantly, Helps stop breakage, Restores softness and shine. Africa's Best Organics Leave-In Liquid Hair Mayonnaise Treatment is formulated to strengthen damaged, dry or over-processed hair. This unique Organic Conditioning formula helps repair, rebuild and revitalize hair. 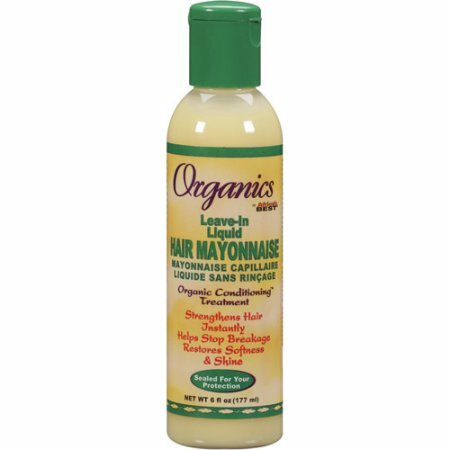 Regular use of Africa's Best Organics Leave-In Liquid Hair Mayonnaise Treatment restores hair softness and shine with greater body and movement. Excellent for all hair types including natural, relaxed, pressed, texturized or colour-treated hair. Enriched with Olive Oil, Egg Protein, Mink Oil, Jojoba Oil, Vitamin E, Silk Protein, Honey, Milk Protein, Cholesterol.